Any chalking may be posted on a campus sidewalk if in compliance with the terms of this policy. Paint may not be used for road markings or any type of signage. It is illegal to tamper with another organization's or office's chalking. The campus reserves the right to clean off and remove any chalking which does not comply with this policy, or UWS 18.06 (17). Chalking area may be used for a maximum of eight calendar days. Sponsor must be clearly stated in the message. Not within 15 feet of any entrance. Must be located outside of any apron, overhang, or area that is not exposed to the weather. Not on any building, sign, structure or wall. Cannot interfere with or overlap someone else's chalking. Restricted to UW-Green Bay recognized student organizations, academic or administrative unit events, activities, or issues. Chalking must be in compliance with the University Alcohol Policy. 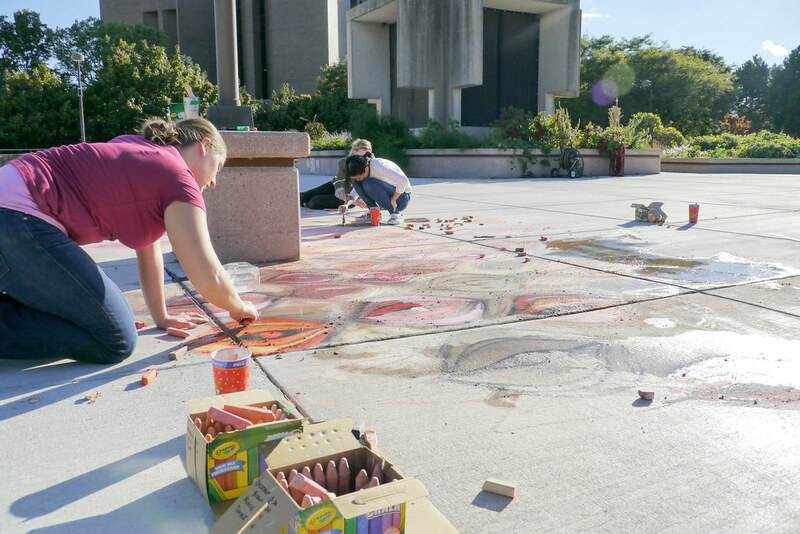 Chalking is NOT permitted in front of the Weidner Center.